Nogales is Arizona’s primary Border Point of Entry; located approximately 60 miles south of Tucson, Nogales saw approximately $25B of cross border trade in 2017, according the U.S. Census Bureau analyzed by World City. Imported products are primarily manufactured goods and produce grown in Mexico; Mexico is a major source of fruits and vegetables consumed in the U.S., particularly during the winter months. Over $3B of Mexican produce enter the U.S. through Nogales every year, according to the Fresh Produce Association of America (FPAA). Geography, history, familial ties, and the ingenuity of border populations have all contributed to the development of a unique trans-border network of growers, landowners, importers, and distributors that, for more than a century, has served as the main conduit for the supply of fresh winter produce to North American consumers. 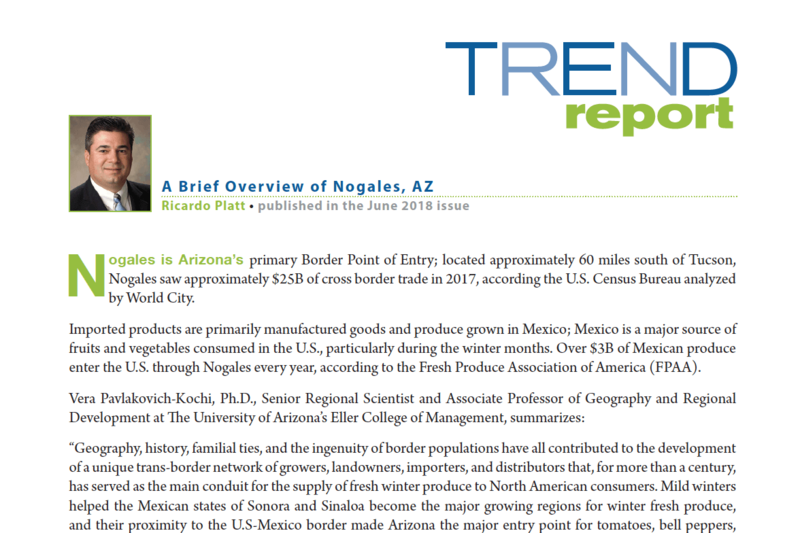 Mild winters helped the Mexican states of Sonora and Sinaloa become the major growing regions for winter fresh produce, and their proximity to the U.S-Mexico border made Arizona the major entry point for tomatoes, bell peppers, cucumbers, squash and green beans into North American markets. Even before NAFTA was implemented in 1994, Arizona’s border town of Nogales – with barely 20,000 residents – was already a major center for fresh produce importers and distributors. About 70 warehouses line Nogales’ Frontage Road handling Mexican fresh produce delivered by truck through the Mariposa border port of entry (BPOE) in Nogales, Arizona. Mexico is a major source of many of the winter fruits and vegetables consumed in the U.S., and Nogales is the leading point of entry into the U.S. for winter vegetables from Mexico. Winter tomatoes, squash, peppers, cucumbers, eggplant, and beans are sourced through Nogales for consumers across the U.S. Many of the spring-season table grapes available in U.S. supermarkets during May and June, along with melons, mangoes, and limes during the winter, originate in Mexico and are imported through Nogales. On the manufacturing side, maquiladoras and contract manufacturers in Sonora, Mexico, manufacture or assemble products ranging from automobiles to household appliances to consumer electronics to medical implements, with Nogales being the major point of entry for these products into the U.S. At the peak of the season, approximately 1,000 to 1,500 trucks per day – carrying either manufactured goods or produce – enter the U.S. via the recently expanded and upgraded Mariposa truck crossing. The Nogales POE is the fourth-busiest land port of entry in the United States, and the $244M expansion to the Mariposa POE completed in 2014 turned it into a state-of-the art facility. Recent innovations include joint inspection of trucks by both U.S. and Mexican authorities that reduce wait times for trucks entering into the U.S.; reducing wait times is critical for time-sensitive products, such as fruits and vegetables that must reach supermarkets at far-off destinations in the U.S. while still at the peak of freshness. Serving this bustling trade is a robust logistics industry that includes U.S. Customs Brokers; produce importers, brokers and distributors; dry and refrigerated warehouses; trucking providers; and, of course, the railroad. Though growth in warehousing space is sometimes constrained by topography (Nogales is hilly terrain), new warehousing space has been going up in Nogales over the past couple of years; particularly in the AZ-189 corridor, and in the Rio Rico corridor along I-19 and its frontage roads. While the AZ-189 corridor’s growth shows a definite skew towards serving the warehousing needs of manufactured or other dry goods, the Rio Rico corridor has seen growth in refrigerated warehouse space for the produce industry. The trucking industry in Nogales has been particularly impacted by recent economic and government trends. A shortage of drivers has become a major concern for the trucking industry across the entire U.S., and Nogales is no exception. Changes in enforcement of federal regulations applicable to Mexican drivers driving in the U.S. with international drivers’ licenses has further reduced driver availability. And, the new Electronic Logging Device (ELD) mandate from the U.S. federal government has impacted the way in which hours of service are tracked; this has increased the total transportation time for time-sensitive goods shipped from Nogales, adding as much as an entire travel day for shipments heading to destinations in the northeast U.S. These (and other) factors have led to significant increases to the costs of shipping goods imported through Nogales; anecdotally, the costs of some routes out of Nogales have seen increases of over 50% in 2017-2018. These costs are ultimately passed on to the end user, representing a significant, negative, and near-immediate impact to U.S. consumers’ pocketbooks. Tucson’s local government has manifested quite a bit of interest recently in developing Tucson as an inland multimodal transportation and logistics hub at the confluence of north-south and east-west transportation corridors. From a certain perspective, this newfound interest from Tucson’s local government is relatively late coming: the first rail car carrying fresh produce from Mexico crossed the border at Nogales in 1905. The FPAA was founded in 1944. The Arizona-Mexico Commission and its south-of-the-border counterpart, the Comisión Sonora Arizona, date to 1959; these analogous commissions were established to foster and strengthen the relationships (including trade of goods and services) between neighboring states that, in some instances, had more in common with each other than with other states within their own respective countries. So, most stakeholders that have been involved in cross-border trade in Arizona for many years welcome Tucson government’s recent efforts to foster growth in trade with Mexico; but Nogales has been the lynchpin in trade between Arizona and Mexico for decades. Ricardo Platt is a Senior Account Executive at CREST Insurance Group, a Tucson-based independent insurance agency with a regional footprint in the U.S. Southwest. Ricardo specializes in advising companies that operate around and/or across the U.S.-Mexico border. He can be reached at rplatt@crestins.com.